Each year, over 6 million first-generation college students embark on their college journeys. However, thousands of these students arrive on their first day of school without the basic supplies they need to succeed, and many struggle or drop out. By hosting a College Survival Supplies Drive, you can help first-generation students across our community to enter their first year of college with the supplies they need to get a strong start in college and achieve their dream of graduation. This DIY Toolkit will provide you with the resources you need to host your own drive. We suggest running your drive for one week, but it can range from one day to a whole month to fit your needs. No special skills are required for this activity! This activity will address the community need of improving college graduation rates. 1. REGISTER YOUR COLLEGE SURVIVAL SUPPLIES DRIVE. Fill out the registration form here and our staff will reach out to make sure you have all the tools you need to create a successful drive. 2. PICK YOUR CREW AND SET THE DATE. Get a team of family, friends and neighbors to help you organize and execute your drive. Then pick a start and end date that works best for your team (we suggest making your drive at least two weeks long to give folks time to shop). Once you’ve picked the location for your College Survival Supplies Drive, you should prepare for the incoming donations. Clear out the space, set up boxes and get organized so your drive can run smoothly. Consider using a locked room to keep high-value items safe. 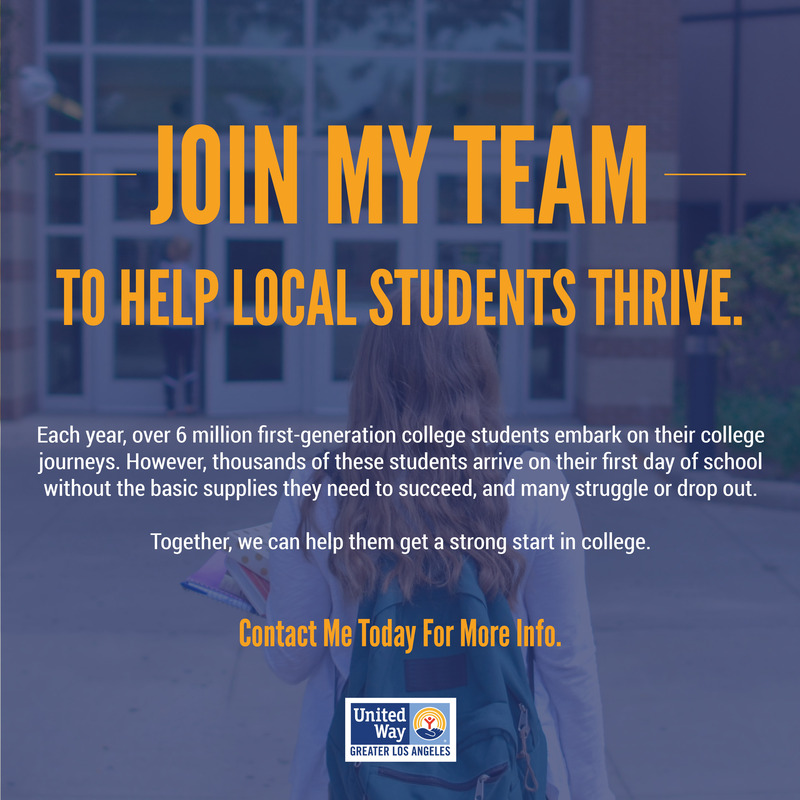 Use the United Way Outreach Toolkit (at the bottom of this page) to let everyone know how they can help with your College Survival Supplies Drive through flyers, emails and social media. Start your supply drive and begin collecting donations. Set goals so you can motivate your community. As you start collecting be sure to take lots of pictures to send to us after your drive. Once your supplies have been collected and the end date has passed, please fill out our short recap survey to let us know how your event went. Don’t forget to send in pictures of your drive to [email protected]. Then, someone will be in touch to schedule a time for you to deliver the donations to the United Way of Greater Los Angeles offices. Be sure to thank everyone who took part in your drive and send them a thank you message. A simple thank you can go a long way. Click below to download flyers, email templates, and social media posts that you can use to make your drive as effective as possible!